In my article about the death of Senator Ted Kennedy yesterday, I used the website «Kennedy Family Genealogy»as a source for information about Ted’s grandchildren. I have noted, however, that the website has not been updated since 23 September 1999, and that is quite a while ago. There must have been many changes to the survey of the descendants of Joseph P. and Rose F. Kennedy since then. The genealogy does not - naturally enough - include the sixth child of Robert Francis Kennedy Jr., for instance (that is Aidan Vieques Kennedy, born 2001, if you wonder). I have googled around, but haven’t found any other website that gives a similar and updated survey of the Kennedy family and which is trustworthy and well organized (the survey at Babylon, for instance, isn’t! And the survey at Wikipedia does not give many sources). If you know of any website that I have overlooked, please tell! Senator Edward Moore «Ted» Kennedy – «the patriarch of the Kennedy clan», «Lion of the Senate», «the liberal stalwart», «the greatest United States Senator of our time» – died of brain cancer at his home in Hyannis Port, Massachusetts, on 25 August 2009. He was born at St. Margaret’s Hospital in Dorchester, Massachusetts on 22 February 1932 as the 9th and youngest child of Joseph P. Kennedy (1888-1969) and Rose Fitzgerald (1890-1995). Ted Kennedy left behind his wife Victoria, his children Kara, Edward Jr. and Patrick, grandchildren Kiley, Edward III, Grace and Max (Allen) and stepchildren Curran and Caroline Raclin. His sister Jean Kennedy Smith is now the only surviving child of Joseph and Rose Kennedy’s nine children. Ted Kennedy served as Senator from 1962 to 2009, following in the footsteps of his elder brothers John F. Kennedy (1917-1963) and Robert F. Kennedy (1925-1968). When Robert was killed in 1968, Ted was offered to take his place in the campaign for the Democratic nomination, but declined. Everyone expected him to become his party’s candidate in the 1972 election, but his presidential ambitions were destroyed by the Chappaquiddick incident in 1969, something his unsuccessful challenge to President Carter in 1980 confirmed. Serving in the Senate for so many years, he probably got far more influence on American politics, especially in the fields of health and education, than he ever would have if he had become President. In a statement on Wednesday morning 26 August, President Barack Obama said that he and his wife «were heartbroken to learn this morning of the death of our dear friend, Senator Ted Kennedy». «For five decades, virtually every major piece of legislation to advance the civil rights, health and economic well being of the American people bore his name and resulted from his efforts». In a public speech held at Chilmark, Massachusetts later on Wednesday President Obama said that Ted Kennedy «became not only one of the greatest senators of our time, but one of the most accomplished Americans ever to serve our democracy». In a tribute to Ted Kennedy Vice President Joe Biden Jr. said that he «changed the circumstances of tens of millions of Americans -- in the literal sense, literally -- literally changed the circumstances». The news of Edward Kennedy’s death has also dominated the news here in Norway. In the obituary by the Norwegian Telegraphic Agency, NTB, published in among others VG, Kennedy was described as the most influential politician in the Democratic Party. NTB mentions among others the late senator’s fight to increase the minimum wage and his opposition to the war in Iraq. One Norwegian expert on American politics, Professor Ole Moen, characterizes Kennedy as a political giant and a "welfare democrat". - His death must be a great loss to Obama, as he was an important voice in the work for reforming the health service. To Aftenposten Ole Moen says that Kennedy’s death "er som en vegg som faller ut av senatet" ("is like a wall of the senate falling down"). - A dynasty has disappeared from American politics. Ted Kennedy will be laid to rest at the Arlington National Cemetery in Virginia near the graves of his elder brothers John and Robert. Peter S. Canellos. «Last Lion. The Fall and Rise of Ted Kennedy», Simon & Schuster, 2009. The Canadian musician, songwriter and painter Joni Mitchell (born Roberta Joan Anderson), who was born at Fort Macleod in Alberta in 1943, has in several interviews talked about her Norwegian ancestry. The Norwegian genealogist Arnfrid Mæland, who holds Mithcell as one of her favourite musicians, invited in June 2009 other participants at the Norwegian genealogy forum Digitalarkivet's Brukarforumet to make a joint effort in finding Joni's Norwegian grandparents and if possibly further ancestry. In early August Mæland published the first draft of part 1 of the singer's ancestry, Joni Mitchell - With ancestors from 'the Voss Fjord part of Norway'. The draft reveals among others that the family of Joni's paternal grandfather Henry Andersen (1873-1952) came from South Helgeland in Northern Norway, while her paternal grandmother Ingeborg "Emma" Gjertsdatter Andersen (b. 1882) came from Modalen in Hordaland county, a few miles north of Bergen. Emma's father was a third cousin of the Norwegian writer Henrik Wergeland (1808-1845). The draft is written in English, while most of the discussion at Brukarforumet is in Norwegian. 8 September 2009: The webpage http://home.online.no/~harmell/joni.html was taken down on Sunday 6 September 2009, but can also be found at Joni Mitchell's official webpage, http://jonimitchell.com/library/view.cfm?id=2113. When the engagement of Princess Madeleine of Sweden and Jonas Bergström was announced on 11 August, the royal court published a cv where we were told that he "has been active in different sport activities including football at top level". Curious about Bergström's football career, I have searched around for more information, but the few articles on the subject gives another picture than the royal court has wanted to show. The Swedish newspaper Expressen wrote already in May 2007 that Bergström started to play football (soccer) only 6 years ago and was viewed as a promising striker. For 10 years he played for several clubs in the Stockholm area before he decided "to retire" only 16 years old to concentrate on school. But football is still an important part of his life, and he still plays amateur football for the Swedish 7th division side Rara Avis BK, which he founded together with friends back in 2002. The other major tabloid in Sweden, Aftonbladet, claims to know that Jonas once dreamt about becoming a professional football player, but when his studies took more and more time he had to make a choice. I have of course asked the royal court's information department for more details about Bergström's football career, but have not received an answer as yet. My blog is just one of several blogs that focus on the royal families of the world. I thought I should make a list of some of the blogs that I have encountered. One of the best blogs around is authored by the Norwegian historian Trond Norén Isaksen. He does not only cover royal news and events, but also finds the time to write about among others history in general, architecture, books and politics. Ever since the Norwegian newspaper Aftenposten decided to stop its “News in English” service in 2008, Trond Norén Isaksen has provided a place for non-Scandinavian readers to find news in English about both royal and non-royal major events in Norway. I must admit that I have partly used Isaksen’s blog as a sort of template when constructing my own blog, mainly because his choice of design is so reader friendly (then again Blogspot doesn’t offer that many different ways in setting up the blog). I promise, however, that I will not be a copycat! There is surely room for more than one royal blog covering among others the Scandinavian monarchies. There are so many different topics to write about that I don’t think it will constitute a problem. It will probably be difficult some times to avoid commenting on the same events, but the emphasis and interpretations will surely be different. I will most likely write more about genealogy than Trond Norén Isaksen, and I doubt that he will ever comment on football or ice hockey! The blog Royal Musings by author and Queen Victoria’s Descendants expert Marlene A. Koenig is also worth a visit. She provides news and commentary about the reigning royal houses of the United Kingdom, Sweden, Denmark, Norway, Belgium, Luxembourg, Liechtenstein, the Netherlands, Spain and Monaco as well as the former European monarchies. Especially interesting are the historical tidbits she posts almost daily. 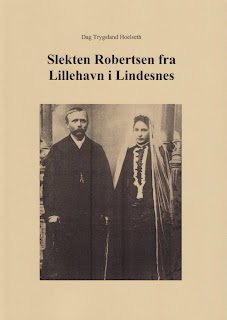 The booklet "Slekten Robertsen fra Lillehavn i Lindesnes" ("The Robertsen family from Lillehavn in Lindesnes") was published last week in connection with the family reunion at Spangereid grendehus (community centre). Every family has a story to tell. This is the story about a fisherman's family from Lillehavn at Spangereid parish in today's Lindesnes municipality in the very south of Norway. The booklet is divided into two main parts. In the first part I have made an outline of the family before Tobias Robertsen (1856-1929) and Andrea Pettersen Høyland (1873-1952) got married in 1891, as well as a short presentation of the two first generations. Tobias and Andrea had 9 children, of which 7 reached adulthood. The second part gives a survey of all the descendants of Tobias and Andrea - the number of descendants has now passed 230. Most of them still live in the south of Norway, but there are also two branches in the United States as well as a smaller line living in Germany. The booklet has 44 pages and is well illustrated. It also contains a cemetery survey as well as a list of explanations and abbreviations, sources and footnotes. The Swedish newspaper Aftonbladet published today an ancestry table (click on the picture for a bigger size) for Princess Madeleine's fiancé Jonas Claes Bergström. The table shows five generations of Bergström's ancestors. The table reveals that Jonas Bergström - besides the fact that he also has Danish ancestry on his mother's side - has higher civil servants, shipowners and directors among his ancestors, but also blacksmiths and soldiers. Jonas Claes Bergström was born at Danderyd on 23 January 1979 as the youngest son of Karl Claes Göran Bergström, b. 5 August 1942, and Elisabet Bergström, née Jörgensson, b. 19 November 1943. Jonas has two elder brothers - Peder, b. 20 December 1969, and Ted, b. 5 January 1972. Peder is married to Sara, b. 1975, and has two children - Victor, b. 2005 and Siri, b. 2008. Ted is married to Karin, b. 1974, and has 3 children - Clara, b. 2002, Tom, b. 2005 and Disa, b. 2009. 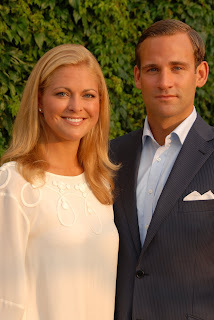 The Swedish Royal Court announced today the engagement between HRH Princess Madeleine and Jonas Bergström. The wedding will take place in late 2010 or early 2011. The official announcement came only a day after the royal court refused to comment on Svenska Damtidning's claims that an engagement had taken place. The media seems to disagree about when the engagement actually took place. Earlier today, the Swedish tabloid Expressen claimed that the engagement took place two weeks ago, after Mr. Bergström had asked the king for permission. But according to the happy couple at today's press conference at Solliden the engagement took place at the Italian island Capri on 12 June! After the king had given his consent, I am sure that he brought the matter up with the government, as obviously the court wouldn't announce the engagement if it was not confident about the government's approval. In accordance with the Act of Succession the government gave its formal approval in an extraordinary meeting today. Unlike Daniel Westling, who upon marriage will become Prince of Sweden with the style Royal Highness as well as Duke of Västergötland, Jonas Bergström will "only" be titled Duke of Hälsingland and Gästrikland. This could be described as an unusual solution in Sweden, but it follows the practice in Spain where for instance Infanta Cristina's husband is titled Duke of Palma de Mallorca by marriage, but without the title Prince or style Royal Highness. Welcome to my new blog! I thought it was about time to create a place where I could air my thoughts on current and past events. My blog will first of all deal with topics within my main interests such as royal and constitutional history, genealogy, travelling and politics. But there are so many things I am interested in, so you shouldn't be too surprised if I from time to time decide to write about other matters, such as current events, football (soccer), ice hockey etc. The blog language will be English, but I might write an article in Norwegian from time to time as well.